Docomo said Monday it will introduce two basic service plans, one with a monthly fee of ¥5,980 for unlimited data and the other charging ¥1,980 for limited data. The company is looking to counter low-cost wireless service providers UQ Mobile and Ymobile launched by domestic rivals KDDI Corp. and SoftBank Corp. respectively. Docomo does not have a budget service brand. Docomo will offer simpler plans by separating charges for handsets and services, as major Japanese wireless carriers are often criticized for their complicated plans that make it difficult to compare fees with those of other carriers and discourage carriers from cutting charges. The issue came under the spotlight last year when Chief Cabinet Secretary Yoshihide Suga urged carriers to cut their fees, as their rates are higher than in other countries and the three major cellphone companies generally log higher profit margins than those in other industries. Suga declined to comment Monday on Docomo’s new service fees. 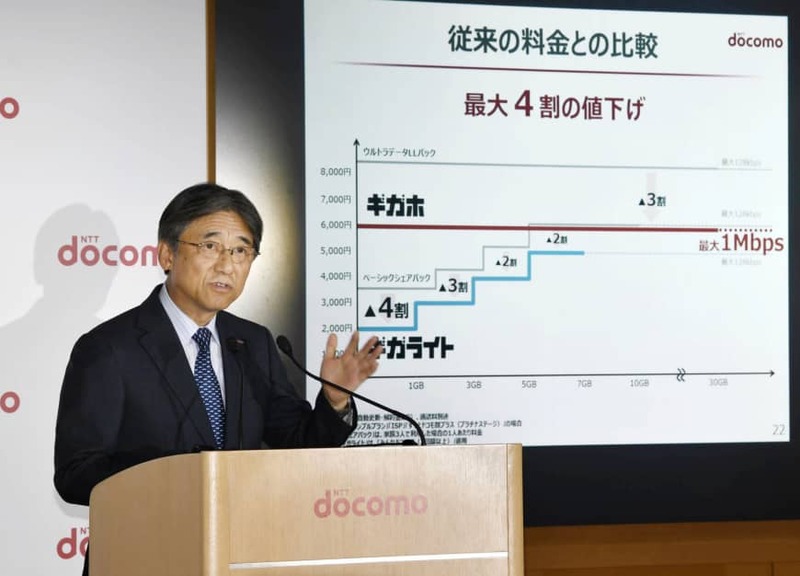 “We will introduce simpler and more reasonable service fee plans after receiving many voices that they have been complicated and difficult to understand,” NTT Docomo President Kazuhiro Yoshizawa said at a news conference in Tokyo. The introduction of the new service charges will reduce the company’s income by as much as ¥400 billion per year, Yoshizawa said. “I recognized some moves (within the government) but we decided to launch the new fee plans to become the leader in the mobile phone market,” he said. Japan’s mobile fees are relatively high. 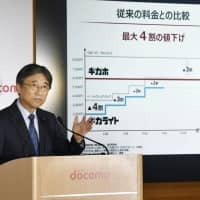 It costs about ¥7,000 a month to download 20 gigabytes of data in Tokyo, the most among comparable cities, including New York, London and Seoul, according to data from the Internal Affairs and Communications Ministry. Japan’s mobile phone market has long been dominated by the top three carriers, which together control nearly 90 percent of the market. Last April, the government granted approval to e-commerce giant Rakuten Inc. to enter the business this October, a move expected to spur greater competition.